The other side of switching to Spanish time and getting to bed late, is that we’re really getting a late start in the morning. Of course, as a night person, I’m OK with that. I’m actually pretty sure that my culture that best matches my body rhythm is Spanish. So, after catching two busses into the centre from the campsite, we were just in time for a late lunch (on Dutch time, perfectly normal lunch time for Spain). We decided to check out a vegetarian restaurant, which had a €12 menú (or three course meal). Some of it was pretty good, some of it was just OK, but ordering three of them was definitely too much – next time we’ll do two and let the kids eat off ours. 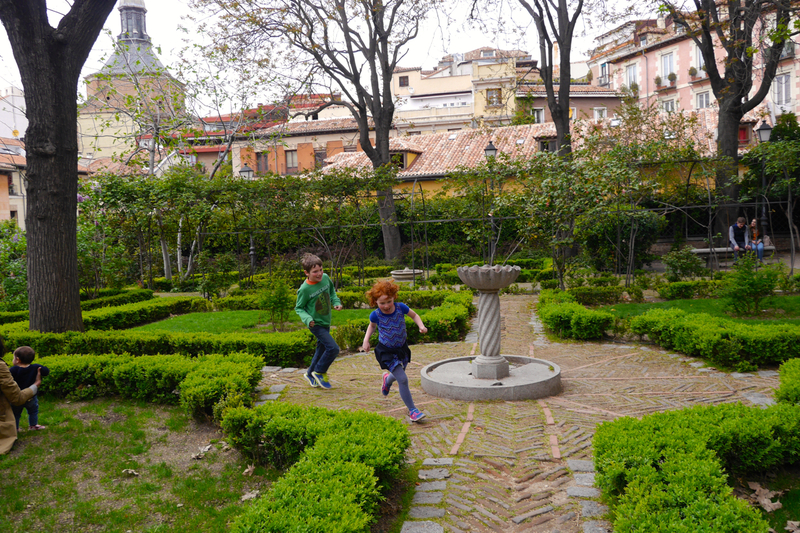 Before and after lunch, the kids let off some steam by running around in gardens. We then walked through a couple of the tourist hits, figuring the art museums and churches would not hold the kids interest. The tourist hits were really, really full of tourists and people trying to sell to them or get their money with “street art”. It wasn’t really our scene, we found km 0 (where all distances in Spain are measured from) and headed off to see one sight. The one sight was to take advantage of the free visit to the Palace for EU citizens from 6-8 pm from Monday to Thursday. It was pretty impressive and ornate, including priceless objects such as four Strativariuses. After that we were done, so we headed back on the bus. Except we made a bit of a mistake. The bus from Madrid overlapped the route for the bus that went to the campsite so we tried to wait for the last common stop before transferring. However, we waited just a touch too long, and ended up further along the route, missing the connection by the time we’d headed back. So, looking at the route map, we thought, oh, it’s just one stop, we’ll walk. Which maybe wasn’t the best idea ever. It turned out to be about a 20 minute walk along the verge of the highway access road. I was really scared that someone wouldn’t see us in the gathering dark. But, finally, with the aid of the iPhone flashlight to light our way at the end, and an almost complete lack of traffic, we made it safely back to the campsite. Phew. To sleep and then off to the beach.